Join us on Saturday October 14! Gather at Tennessee St at 24th. GBD volunteers will be out on Saturday, October 14 to help add new street trees all over the district. Tennessee Street between 23rd and 24th will get a major makeover; we’ll be adding trees to the Penn Ave garden near 23rd; Benches Garden gets street trees along with some of the surrounding properties. Street trees will pop up all over! Thanks to The City’s Bureau of Urban Forestry, the nonprofit Friends of the Urban Forest and the neighbors and businesses who adopted trees. Volunteers will meet at Tennessee and 24th at 8:30 am, plant until midday, then break for a celebratory lunch. Sign up at GreenBenefit.org. 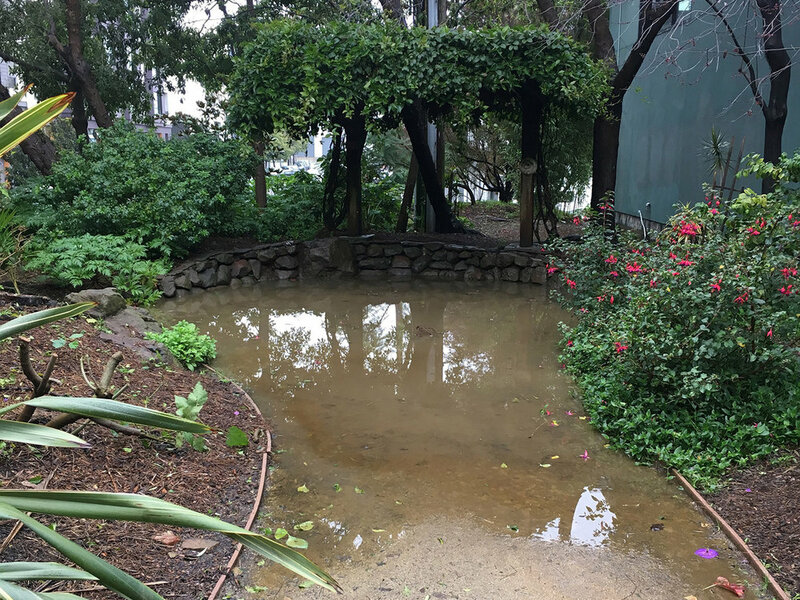 The GBD has completed the installation of water-efficient irrigation systems in Progress Park, Angel Alley and Fallen Bridge Park. GBD parks are designed to be drought-tolerant, but the irrigation systems will help the parks bridge the dry summer months. Automatic irrigation also reduces the labor involved in hand watering and allows crews to focus more time on other types of park care. 160 New Trees Coming to Our District! Will one make its home near yours? Trees are free! Friends of the Urban Forest will inspect for utilities, cut sidewalk basins, provide the trees and prune them for 5 years at no cost to property owners. Property owners can choose tree species from an approved list. The project will attempt to plant and replace trees in every viable location in the district. If you do NOT want a tree at your location, you will need to ACTIVELY OPT OUT on FUF’s website before September 1 at https://www.fuf.net/dogpatch/. We had two volunteer events in the district in June. The entire local staff of Forest City observed their company’s national day of service by planting and weeding at Progress Park, followed by a well-earned wrap up at Harmonic Brewery. Janet Carpinelli gathered neighbors to do some infill planting at the native plants garden at Woods Yard. We are grateful for the improvements that these volunteers made to our parks. Think about joining us at future park workdays. Interim repairs have been completed at Minnesota Grove as we work out timing for larger scale improvements to the north and south ends of the park. Winter rains cause quite a bit of flooding in the north end and the path had become worn and rutted. GBD crews improved drainage, stabilized the path borders and resurfaced the path. A trash bin and dog waste bag station were also installed. The Grove is bursting with sprouts and flowers. It’s a good time to pay a visit. GBD crews installed brick edging along the planters on the Tennessee side of IM Scott School and bricked a through-garden path at the white zone that is used heavily by the local kindergarten kids. Park Steward Janet Carpinelli urges us to take note of the native plants nurtured in that garden. Question: Should 4-way stops be implemented at 22nd Street and Minnesota and Tennessee Streets? 89 People responded to the survey and showed strong support for the 4-way stops. 75% Supported a 4-way stop at Minnesota and 69% at Tennessee. 17% wanted neither. A summary of the responses has been sent to Public Works and the MTA. Neighbors and friends gathered at the Esprit Park dog run on Saturday, April 1 to refresh the bark chips (supplied by the GBD), weed and prune. It was a fun April Fools Day and the group of volunteers left the run tidy and ready for warmer weather. Our landscape contractors, Frank & Grossman, kindly passed on to the GBD some surplus agave and Black Mondo grass plants. Progress Park steward Bruce Huie, Tunnel Top Park steward Bonnie Bergeron, Toes and Paws founder Irma Lewis and neighbors got together this month to place the windfall in the area alongside the 280 onramp on Indiana. Thanks F&G! The GBD is co-sponsoring a series of workshops Jan 27-29 on the very localized impacts of climate change - drought, flooding, sea level rise - and how surrounding development will alter their effect on our district. We will look at what we can do on a neighborhood level to reduce the negative impacts of climate change and to become more resilient. Hope Rising of the Washington State University will lead the series of workshops. High school and college students are welcome. The Planning Department is looking at possible upgrades to the Dogpatch public realm in light of the increase in development and our resident population. The department is conducting an online survey regarding uses and aspirations for Esprit Park. Click here to take the survey. 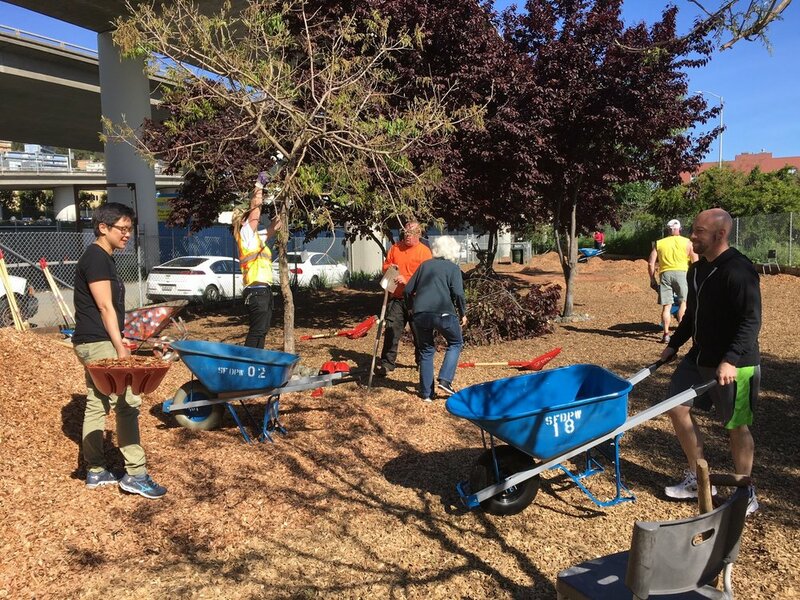 Over 100 Warriors fans and PG&E employees, GBD Board members, and Dogpatch and Potrero Hill neighbors participated in a Warriors-sponsored Neighborhood Revitalization Day organized in cooperation with the Green Benefit District. Volunteers helped to transform a long stretch of Pennsylvania Avenue from a neglected, weedy, trash-filled and debris filled wasteland into a safe and attractive landscaped walking path. Our friends at Catmex Maintenance did a terrific job of preparing the site for the workday and getting the new path in. Neighbors donated succulents. The volunteers came through, doing an amazing amount of work in just one day. Even Warrior David West came out to wield a shovel. The GBD/Warriors/PG&E workday also included upgrades to the Progress Park dog run. Volunteers replaced all the bark chips in the run, filled and planted a new perimeter planter, and filled in the wood iris planted along the sidewalk border. Plants along the fence line that are not healthy for dogs were cut back. Catmex is adding irrigation for the plants and improving the dog drinking stations. With more and more dogs in the City, every off-leash space is a precious resource. All of Progress Park is a treasure. We are grateful to the park stewards who created Progress Park. The GBD is proud to included it among our maintained parks. Dogpatch residents have created wonderful open spaces out of almost nothing. Minnesota Grove (Minnesota at 24th) is shaded by mature trees and is full of bird and butterfly habitat – and it sits at the heart of the new Minnesota Street Arts District. The Green Benefit District repaired the Grove’s damaged north retaining wall and reinstalled irrigation lines. Neighbors pitched in to replant just in time for our first autumn sprinkles. Check out the north side of Minnesota Grove as it comes back to life. Opportunities to add public green space in our neighborhoods are few. Neighborhood volunteers have been working to convert a trash-collecting trouble spot - the freeway right-of-way around HWY 101 at 17th Street - to a green and usable public space. The Eastern Neighborhoods Citizens Advisory Committee has thrown its support behind the project by awarding $1.75 million towards its construction. Loop Volunteers have already raised over $300,000. The EN CAC award leaves them just $750,000 short of their fundraising goals. Project details at PotreroGatewayPark.org. 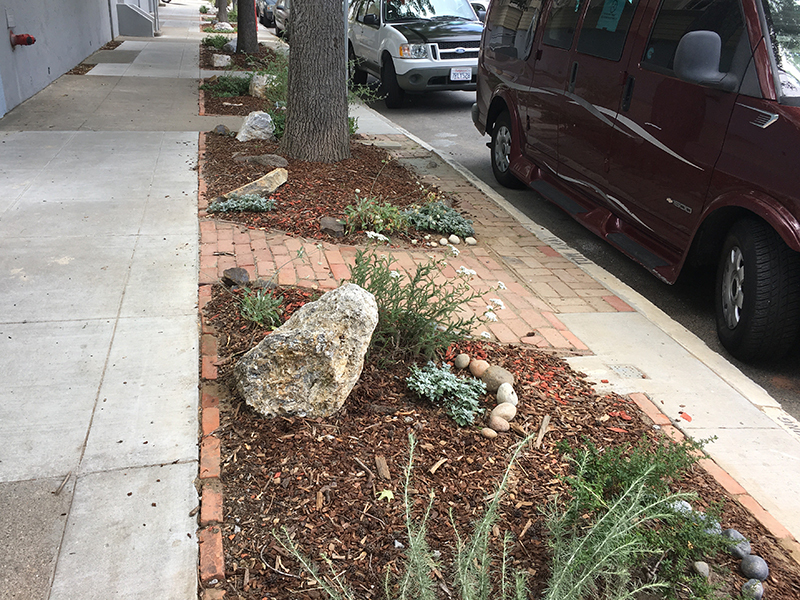 The Home Owners Association at Pennsylvania and 22nd Street, with the help of Friends of the Urban Forest and the Green Benefit District, have transformed their corner into a lovely urban oasis, another step towards making our neighborhood more walkable, comfortable and friendly. The Green Benefit District has installed dog waste bag stations at test location around the district. More to come! 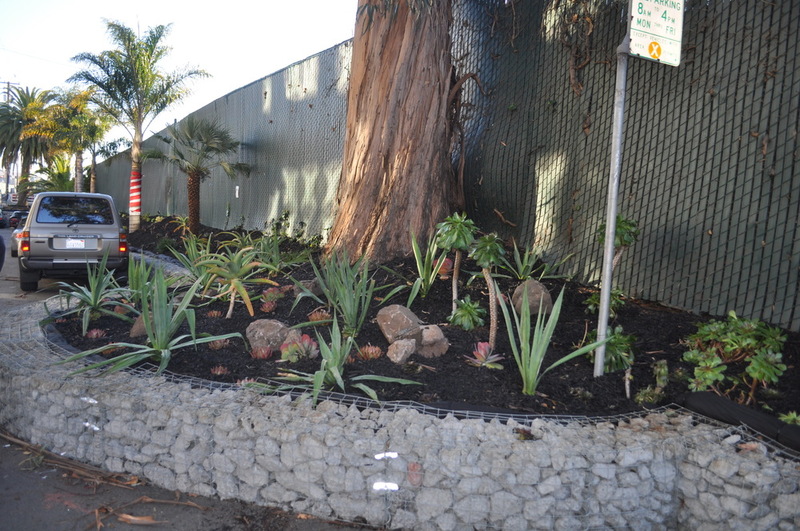 The Northwest Potrero Benches Garden got help preparing for new Caltrans fences. Our hard-working helpers from Frank & Grossman Landscaping and Aim to Please Janitorial are out in the neighborhood weekly. Both are District 10 businesses. Let us know how we can help keep Dogpatch and Potrero cleaner and greener. The Green Benefit District welcomes its first Executive Director, Julie Christensen. Julie brings experience spearheading important civic projects like the North Beach Library, Joe DiMaggio Playground, Coit Tower and Helen Wills Park. She has led advocacy for the extension of the Central Subway and numerous pedestrian safety efforts. Julie hit the ground running in June, meeting with City staff, local residents, business leaders and project developers to maximize opportunities for Dogpatch and northwest Potrero Hill. This spring the GBD funded improvements to a number of area parks including major pathway repairs at Esprit Park. Esprit’s west pathway was compacted, poorly defined and prone to flooding from irrigation and rain. With help and oversight from the Recreation and Parks Department, the path was regraded and resurfaced and bordered with a rain garden water collection basin. Let us know what you think.. The Eastern neighborhoods are changing rapidly. Residents and businesses have the opportunity to weigh in on plans and issues at a couple of upcoming meetings. The Planning Department is doing am overview study of open space and public realm and street planning needs in Dogpatch. The first community meeting focused on parks. The second will look at streets, including parking and pedestrian safety. Two new service providers just started cleaning and greening the neighborhood sidewalks and green spaces. They’re wearing GBD vests so the neighborhood can see their assessment dollars at work. supplement SFPW graffiti removal from public realm areas, including street signage, telephone poles and power lines, street furniture, etc. Supplement San Francisco Public Works efforts to remove illegal dumping and respond to requests for trash removal from public realm areas. Angel Alley Park Steward Sari Stenfors with Frank + Grossman landscapers Frederico and Michelle. Landscaping services including: weeding, pruning, weed control, edging, fertilizing. In parks with automatic irrigation control systems: program, check and maintain system. In green spaces without automatic irrigation control systems: Use existing water sources to hand water plants. Your Green Benefit District Board: keeping our neighborhood clean and green. The GBD has moved quickly to refresh and revive our green spaces. Already seven green spaces in the district have seen improvements, thanks to the Jumpstart Program. Esprit Park will soon also see improvements. Three of the District's seven green spaces that will be getting 'Jumpstart' services. GBD’s first main job is to take care of our delightful existing parks and public spaces – nearly all of which were envisioned, built and/or revamped by our neighbors and friends. The GBD Management Plan calls for a ‘jumpstart’ agenda: to see which spaces need attention right now. So on December 31, 2015 the services committee toured the District, and made recommendations to the Board -- which had its own tour on January 10th. Seven spaces are included the jumpstart: Progress Park, Minnesota Grove, IM Scott sidewalk greening and Woods Yard park in the Dogpatch, and Fallen Bridge mini-park, Benches Garden, and the ‘Potrero Loop’ in Northwest Potrero. Now we are busy planning for long-term maintenance and improvement contracts for services to all the green spaces included in the Management Plan, as well as district-wide services. If you have any ideas, thoughts or suggestions, please let us know! And if you know of a green space in the city which is NOT already included in the GBD Management Plan, we are accepting applications for GBD maintenance funding. Clean, maintain, enhance, and expand Public Realm areas in the Dogpatch and Northwest Potrero Hill neighborhoods. Promote sound ecological practices with a locally controlled, sustainable, and transparent funding structure. Promote a high-level of transparency and accountability in how GBD funds are spent. Board Members are required to attend monthly Board Meetings as well as perform Committee work. Board Members should look forward to working together along with a part-time paid Executive Director and maintenance staff.